My library doesn’t normally look like this. But I got a bee in my bonnet while choosing what to read next and then this happened. The other night I was picking a selection of books off of my shelves in order to decide what to read next. While doing so, I was cognizant of my decision to take part in A Century of Books and thought I should start keeping track of the years in which each of them was published. 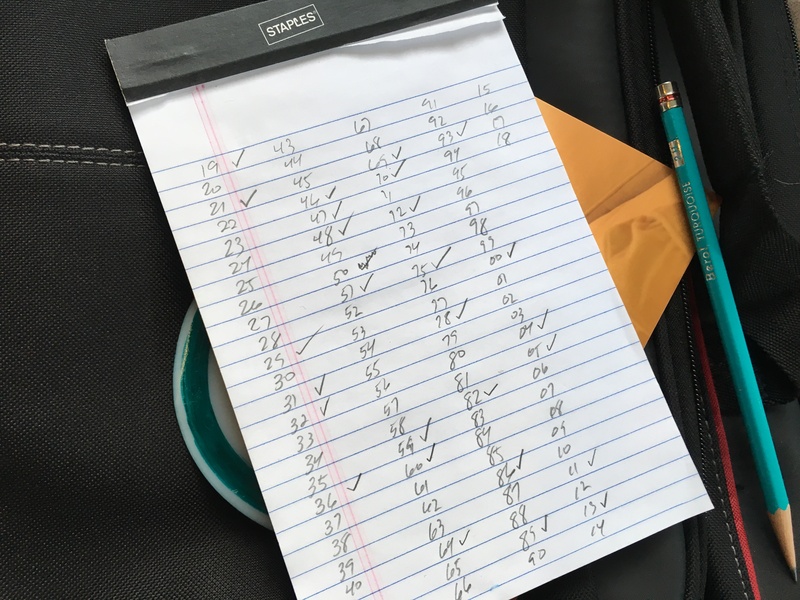 I made a checklist to make sure I didn’t duplicate years. After I had pulled together an interesting looking pile of almost 30 books to take up to my nightstand…I had a mental breakdown brilliant idea. Wouldn’t it be great to have a full list of all the books I own but haven’t read organized by year published so that I could make my ACOB choices from all that was available to me? Lucy helping me get things organized. I’m checking the internet to see when certain things were published. Took every book I haven’t read yet off of my shelves. Moved all of the books I have read to one side of my bookcase and kept them alphabetical by author. It turned out that out of 30 shelves of fiction, the ones I have read only took up 10 shelves. 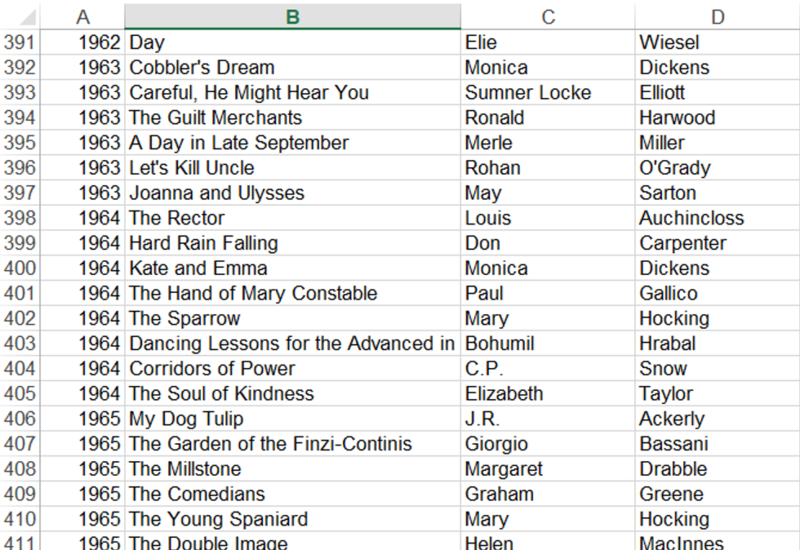 Went by decade and created a spreadsheet with year published, title, and author for every book, then stacked the books according to the corresponding year of that decade. 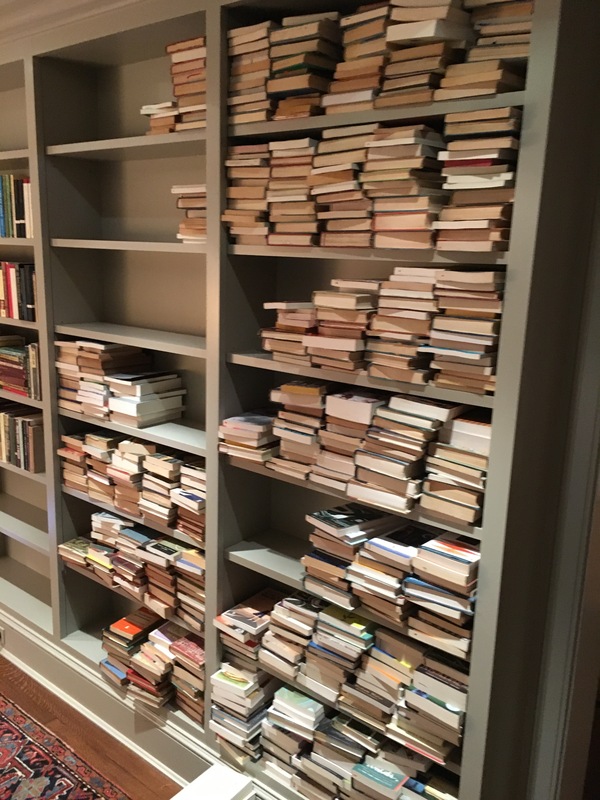 Once I finished a decade I would sort the spreadsheet so I could put the books on the shelf in order without having to alphabetize in my head. Part of the TBR sorted by decade. A sampling of spreadsheet delight. The beauty of having all of my TBR in this format will make ACOB so much easier to pursue. Let me say I was astounded by how many unread books I own. I was even more astounded by how inter-shelving read and unread books kept me from understanding how much variety I had to choose from. 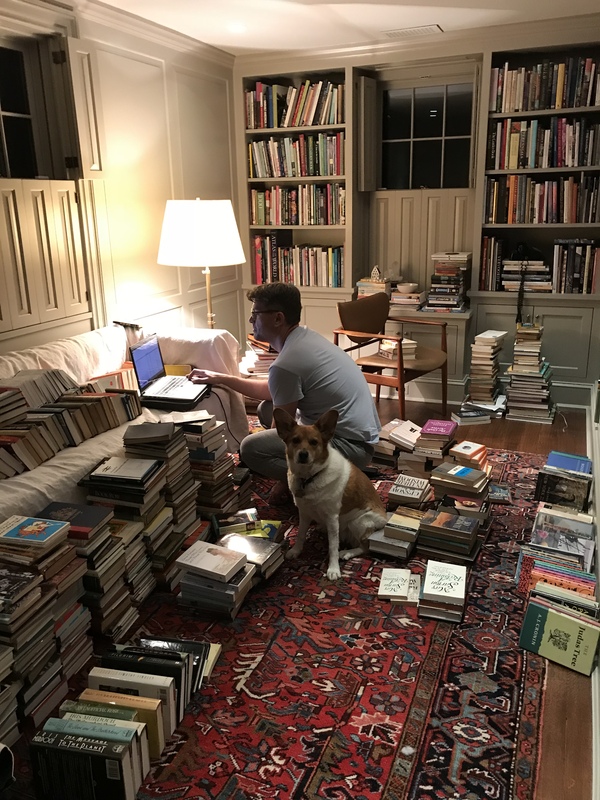 Once they were all sorted and put in order–all 726 of them–it became clear that I would be able to satisfy 99 out of the 100 years of books for ACOB. 2018 is the only year for which I don’t already own a book. Most years I have at least four or five books to choose from. I think there is only one year for which I only have one book. Lucy trying to tell me I’m crazy. In the coming weeks I am not only going to make my full TBR list available, but I am going to be breaking it down by year. In the meantime you can look at the organized shelves. Also check out the video at the end of the post. I did a the spreadsheet exercise a couple of years ago but only recently added the publication date. I never thought about organise the shelving thet way though. I feel another sort out coming upon me…. If I wasn’t doing ACOB, I don’t think I would ever put books in chron order. It has been surprising to see which novels are neighbors on the shelves. Some of the juxtapositions are quite interesting. I think when the challenge is done I will still keep the TBR separated out but put them back in alpha order. We’ll see. I can see that having them co-located would give you a sense of how styles/preoccupations evolved over time so yes that would be great for ACOB. I feel another sorting coming down the road as well… I only have three more books to complete my own ACOB, but am definitely going to sort through my TBR pile to get the years sorted out if I decide to do another ACOB. In the meantime, my ankle is in a cast so the book-sorting will have to wait. Unless you want to come to the wilds of West Texas and help me?…. An ankle cast means more reading and less organizing. Hope you get better soon. In 2012 when I did ACOB my problem was not having enough choice for each year which then turned into a death spiral of not reading. I feel much more confident this time around having more choices identified. While editing podcast eps, I often have to find things to do while listening, and that has involved putting the correct date next to every book in my LibraryThing catalogue, and tagging whether or not I’ve read them. So I have done similar prep but less satisfyingly visually. I was going to make a TBR list in Goodreads but it doesn’t automatically capture the original publication date and there wasn’t really a way that i could find to sort by year anyway. So I decided to get old school with it. Being both a book and Excel geek, this is the kind of project that makes me giddy. You are definitely prepared for ACOB! Happy reading. It really has prepared me well for ACOB. I finished a book yesterday (von Arnim’s Vera) and it was so easy to go into my library and pick a few off he shelves. I ended up starting Edith Wharton’s A Son at the Front, a WWI novel published long before Susan Hill was born. That’s a level of organisation that just leaves me in awe. It is one of my great joys in life. Not being an Excel geek, I appreciate the work and effort you are putting into this project. I am excited I get to ride your coattails in a way; if I need a Year I can look at your list for ideas. Amazing you have 726 unread; I have much fewer, but I have much less space. All of the online resources I’ve been able to find about novels published by year usually only list the “important” novels that are often not what I want to read. My list, when I post it, will give lots of ideas for the not so important, but way more enjoyable, books for each year. You inspired me to do something similar after seeing your pictures on Twitter. I already had tbr books in one half of one of my bookcases. So all I needed to do was get them off, note down year published (to aid ACOB) get rid of a few I decided to cull (not many) find two duplicates and put them all back tidily. My tbr stands at 206 and I had convinced myself it was nearly twice that. I got rid of a few as well. Maybe about 3 duplicates and then two more that I just don’t want on my shelves anymore. I like seeing your book piles. Every few years I get the urge to sort through my shelves- sometimes due to a challenge, more often just for the heck of it. I have kept my read and un-read books shelved separately for years, with details organized on LibraryThing catalog…. My, what big ears Lucy has! She’s so endearing. I used to keep my TBR separate and I think I am going to enjoy having it that way again. When it comes to organizing it really does become an all or nothing endeavor at a certain point. Hard to just tidy up around the edges. It all has to come down to be able to go back up. Sorry, I can’t comment. I cant stop laughing. I would so love to do this but can’t quite bear it yet. Yes, they look great! 700+ unread! 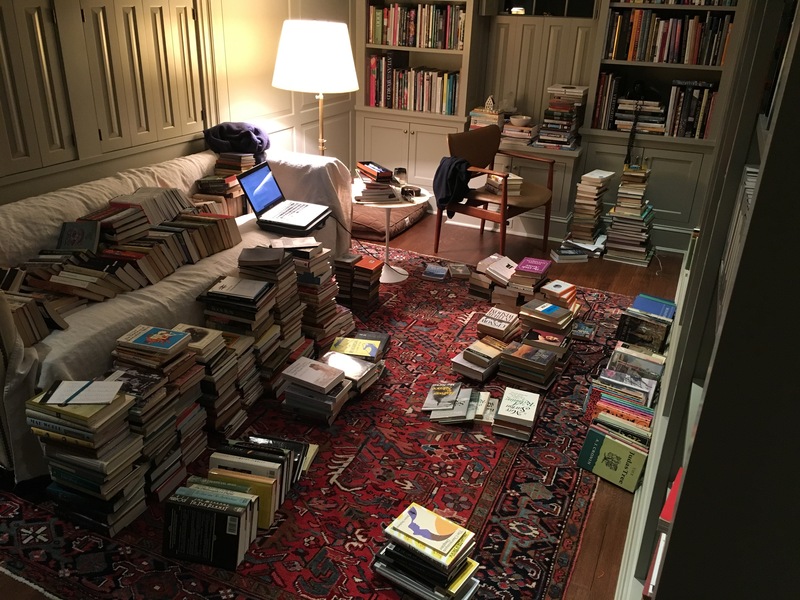 I did a similar exercise this week, made a list of my 270+ unread books by year published and I am missing only a few years for the 1900 to 1999 period. I can’t decide whether to try to finish ACOB in one year and therefore only read one book for a given year or to take more than a year so I don’t limit myself to reading only one book for a given year. Last time it took me closer to 18 months to finish. When I kept my reading strictly limited to ACOB requirements it really slowed me down and took away my will to read. This time around I am struck by the fact that I have so many from 2016 and 2017 that I want to read that it is going to be hard to not binge on those years. I dust and count and cull my small collection every few months.I have under 400 books. Well that is really in the eye of the beholder. To me abnormal would only start to kick in at <100. This is incredible! Not long back I decided that I would change my shelves to ‘read’ and ‘not read’. Thankfully? 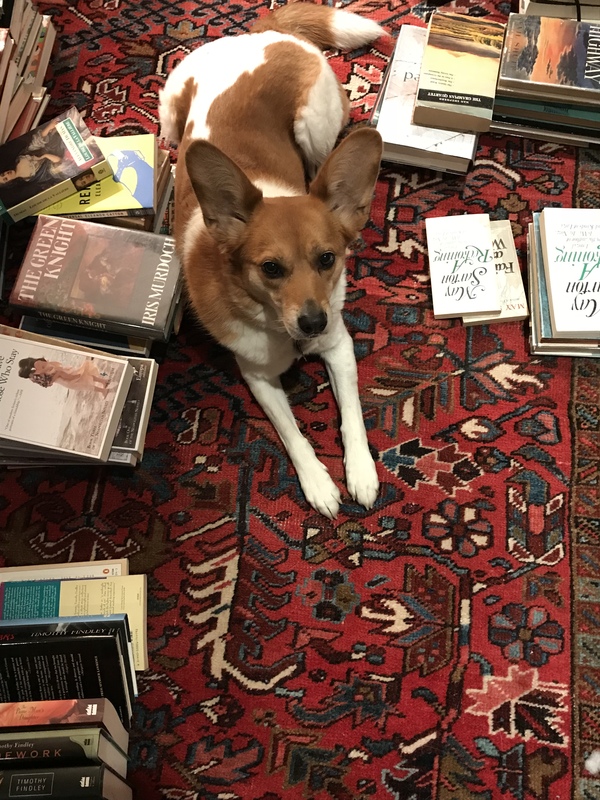 I have fewer books than you. But it made it really clear to me how many unread books had been living on my shelves! Your library looks amazing… Good luck with the 100 years! Sounds fantastic, though not sure I could do it. There would be too much book buying involved. I really think having them separated is the only way forward for me. It seems particularly important for prolific favorite authors where it is really easy to forget what you have read and not read. I started a spreadsheet for my unread books also, I think I’m up to 183 unread fiction books (still haven’t cataloged the non-fiction). I was able to sort by year and most of my books are concentrated from the 1920s to 1950s, with a lot of multiples. I’m wavering over trying to start ACOB (I have about 65 years covered), or just commit to reading more of my owned and unread books. It’s a conundrum! And I love how Lucy is sitting right in the middle of it all. I’m sure she was very helpful! I’m going to shoot to finish ACOB this year, but like you, I think just making a dent in my TBR is a bigger/better goal for me. Thankfully I have been keeping track of my read books since 1994 so I have a pretty complete list. But I do feel your pain. I read a lot of Hermann Hesse prior to then so I don’t really have an accurate idea. This is so impressive!! 😊 I havent heard of ACOB but it sounds like a fun challenge! And I love the fact that you have a large TBR, that’s fantastic!! Good luck! Fabulous! I keep my TBR in order of acquisition but I do try to check incoming books for ACOB suitability (I’m going to have to woman up and start specifically looking for books to fill the gaps soon). Thjis is SO COOL though. Sometimes if I get really OCD I start to think about keeping track of where and when I buy/acquire every book. So far I haven’t given in to that. All I can add is how on earth are you going to choose between ‘The Garden of the Finzi-Continis’ and ‘The Millstone; for 1965? Since there are Drabbles elsewhere on the list, the Finzi-Continis may win out. This is delightfully nerdy! Honorary librarian points for you! Another great posting! I wish I were as talented with spreadsheets as you are. If you aren’t dealing with complex calculations, Excel is pretty easy to use. Especially when organizing this kind of information. The key is to break data down into the simplest data fields. That is why I have separate columns for authors’ first and last names. It makes it really easy to keep the Fanny Trollopes separate from the Anthony Trollopes when you have Excel sort the data. Am I the only one who watched that video several times (stopping to admire individual shelves too)? Just beautiful! That is good to know. I wasn’t sure how well that would be received. It sounds like a lot of work but the end result looks very nice. I’m not sure I’d be able to maintain such shelving though even though in theory it should be easy. We’ll see how long I keep it up. Wow. Just wow. Overcome by the work that went in to it, and awed by the list produced in the end (that is right up my nerdy alley!). I’ve always kept my “unreads” separate from my “reads” for my sanity’s sake, and I not only have a list of all the TBRs with the date acquired, but I actually shelve my TBRs by date acquired. 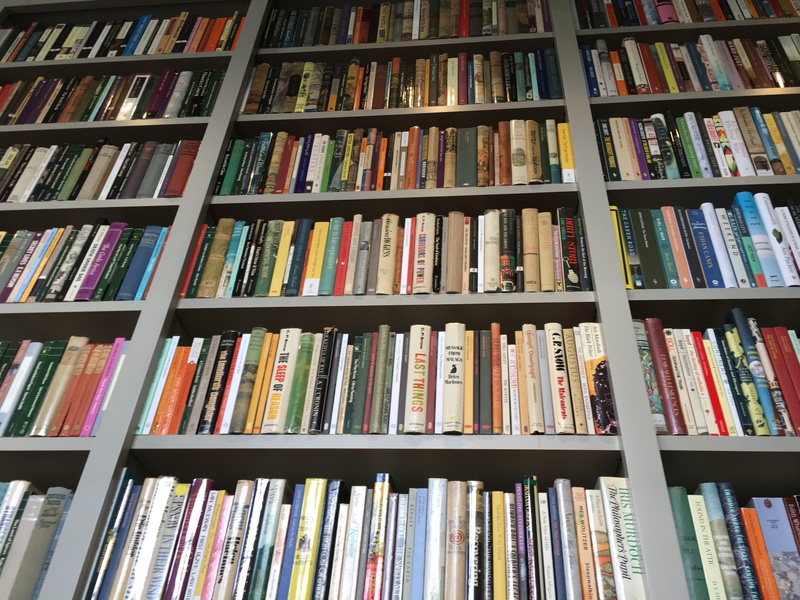 I like the chronological shelving, though, for just seeing that sweep of literary history all in a glance..as you mentioned, it keeps some perspective as to who was contemporary with whom and the proximity of their publishing times. I also saw a lot of similar titles on our shelves (like the Forsyte Saga and M. O’Farrell’s This Must Be the Place, just to name 2 whose spines caught my eye). I may have to do as Laura C did and re-watch the video with some pauses to catch more. Looks gorgeous! Happy reading to you.